Superglue (Loctite gel, purchased locally, or Nexaband S/C, purchased from Abbott Laboratories, North Chicago, IL, USA). a National Research Council requirements for mice (Nutrient Requirements for Laboratory Animals, 1995). a. For accurate and reliable identification, transponders are used (see above Figure). b. Each mouse is briefly anesthetized for 1–2 min with isoflurane inhalation administered either via nose cone or with an instrument designed for small animal anesthesia. c. An electronic ID chip is then implanted using a sterile syringe beneath the dorsal skin between the shoulder blades. d. A portion of the distal tail (1 cm) is sampled and frozen for later analysis of DNA polymorphisms. e. The injection wound is closed with a drop of superglue before each mouse is allowed to recover from the anesthesia. f. Mice without transponders are given a left-ear or right-ear punch for identification. Submitting PI notes: "An ANOVA of lifespan using diet, strain, and transponder as between group factors indicated no main effect of the transponders (p=0.22) and no interaction with diet or strain or both (p>0.8)." a. At 2–5 mo of age mice are fed ad libitum (AL) or 40% diet restriction (DR; 60% of strain-specific AL intake). b. DR rations are calculated on the basis of AL food intake measured weekly for each strain and adjusted for wastage (Ikeno et al., 2005). To measure food consumption, the amount of chow removed from the cage hopper and the spillage (the chow on the bottom of the cage) are weighed weekly. Actual food consumed is calculated by subtracting the spillage from the chow removed from the hopper. c. DR mice are fed approximately 1h before the start of the dark phase of a 12-hour light/dark cycle (lights on at 0050h). d. Rations are weighed to the nearest 0.1 g and delivered manually to the bottom of the cage, rather than the food hopper, to make gnawed pellets easier to grasp and more accessible. e. The AL and DR cages are maintained side by side in alternating columns of AL and DR to minimize the potential for shelf-level variation in AL food intake. f. Because AL mice exhibit a substantial decline in their food intake with age, the DR rations are kept constant and fixed by 12 mo of age. a. 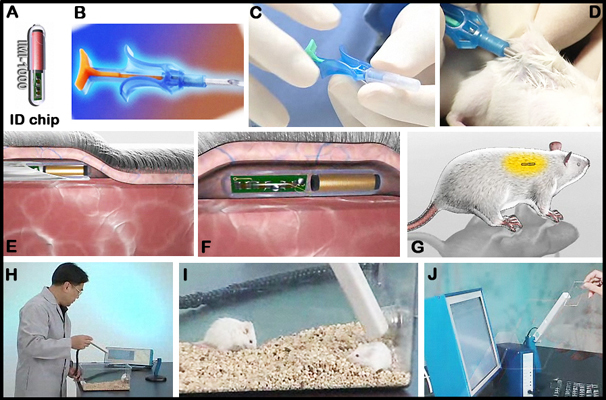 At 15-17 mo of age, mice are immobilized using a plastic restrainer tubes (no sedation) placed in the QMR machine. b. Whole-body-composition analysis is conducted, and AL and DR mice are analyzed over the same time period. c. From scanned images, total body fat mass and lean mass are calculated. d. Body weight is recorded using a balance scale. a. When half of the mice from the same diet and strain die, the remaining mice are consolidated in a single cage in keeping with the original cage density (5 for AL, 6 for DR). b. Mice are examined at least daily for signs of ill health and any mouse found dead is noted. c. Moribund mice are euthanized (a mouse is considered severely moribund if it exhibits more than one of the following clinical signs: (i) inability to eat or drink; (ii) severe lethargy, as indicated by reluctance to move when gently prodded with forceps; (iii) severe balance or gait disturbance; (iv) rapid weight loss over a period of 1 wk or more; or (v) an ulcerated or bleeding tumor). /> d. The age is recorded as the best estimate of its lifespan. QMR: Quantitative magnetic resonance (QMR) system measures whole body fat mass, lean tissue mass, free water, and total body water in live mice, without the need for anesthesia or sedation, in less than 1 min.